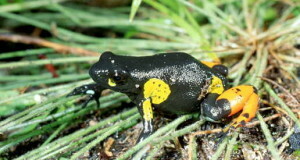 Frogs that are clad in yellow, orange, and red, such as Fire-Bellied Toads and Red-Eyed Treefrogs, often become somewhat dull in coloration after a time in captivity. I’ve noticed this in a variety of species under my care in zoos and at home, yet the phenomenon is rare in the wild or among animals kept outdoors under semi-natural conditions. Color loss can also indicate a health concern (please see below), but often the affected animals are robust and doing well. A photograph showing an astonishing difference in coloration between Red-Eyed Treefrogs maintained on 2 different diets recently caught my eye, and I thought it might be useful to summarize the related research here. Acquiring Color: Why are Red Frogs Red? 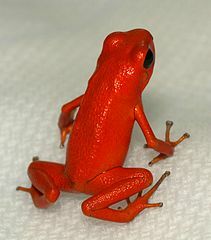 Pigments known as carotenoids are responsible for most of the orange, red and yellow coloration exhibited by frogs. Color is important not just from an aesthetic point of view (or a monetary one, for those who breed “designer frogs”!) 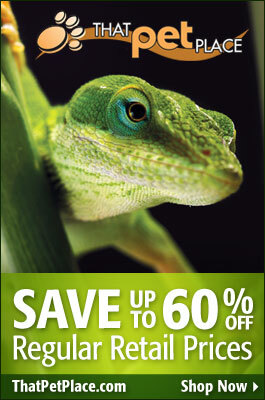 but may also affect breeding success and the ability to hide from or deter predators. In addition to these roles, carotenoids also act as antioxidants and function in the immune and other systems. Carotenoids are manufactured by plants, bacteria and fungi; frogs and other vertebrates must obtain them from their diet. Researchers at the University of Manchester and the Chester Zoo investigated carotenoid levels in three species of crickets and three different cricket diets (Zooquaria, No. 5, p.6). One of those studied, the Domestic or House Cricket, Acheta domesticus, is used for pet food in the USA. The others – the Tropical House Cricket, Gryllodes sigillatus, and the Mediterranean Field Cricket, Gryllus bimaculatus – are more commonly seen in European and Asian collections. A diet comprised of fruits and vegetables provided crickets with the highest carotenoid levels. A tropical fish food (flakes) diet resulted in intermediate carotenoid levels, and the lowest levels were seen in crickets feeding upon wheat germ and other grains. Mediterranean Field Crickets achieved higher concentrations than did the other species, but none retained carotenoids for very long. Carotenoid levels plummeted within 48 hours, so gut-loaded crickets should be used within a day or so after consuming fruits, vegetables and other carotenoid rich foods; please see the article linked below for further information. Although the study was spurred by an interest in the effect of carotenoids on the immune system, the coloration aspect is starting to attract attention (please see photos of red-eyed treefrogs here). Further study is needed, but it’s clear that adding fruits and vegetables to the diets we provide crickets, roaches and other feeders makes good sense. Bear in mind also that this study looked at one aspect of diet…fresh produce no doubt offers a wide variety of other health benefits. As a novice bird keeper long ago, I learned that flamingos denied sufficient shrimp and canthaxanthin soon “bleach-out”…today we still know far more about this topic as it relates to birds than to amphibians. But some of that knowledge may have applicability to herps – in any event, I hope that more private keepers and researchers will take an interest. I’ll stay alert for updates; in the meantime, please post any relevant thoughts and links below, thanks. It appears carotenoids are pretty complex group of compounds and different ones have different benefits in the animal diet. In particular a lot of focus on astaxanthin. After reading this I began adding Repashy Superpig to my FF media as well as dusting with Paracoccus powder and Spirulina. My pair of pumilio are raising tadpoles so at least it doesn’t hurt…and may even help as the study shows. Thanks, Joseph, nice to hear from you. I hope all is well.